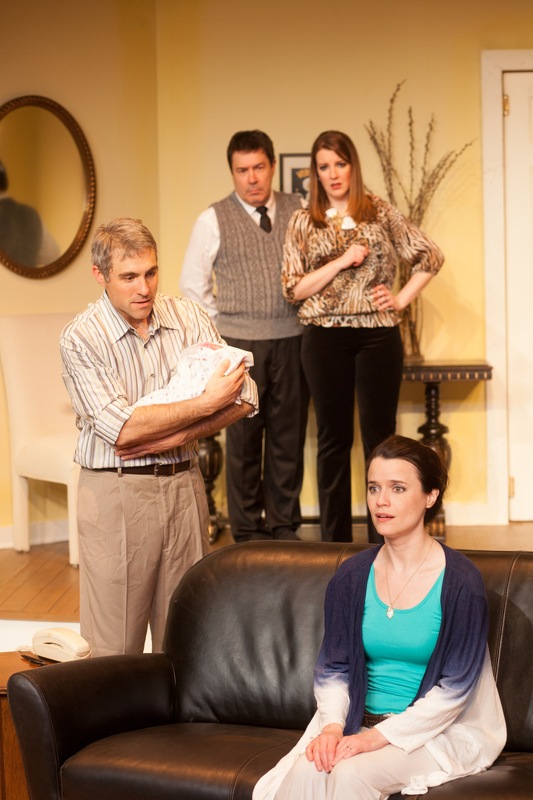 The couples react to shocking news at the end of “Kosher Lutherans” at HotCity Theatre. We’ve seen quite a few holiday-themed shows this season on local stages and this unusual entry at HotCity is a delightful little comedy that has a lesson in tolerance for us all. 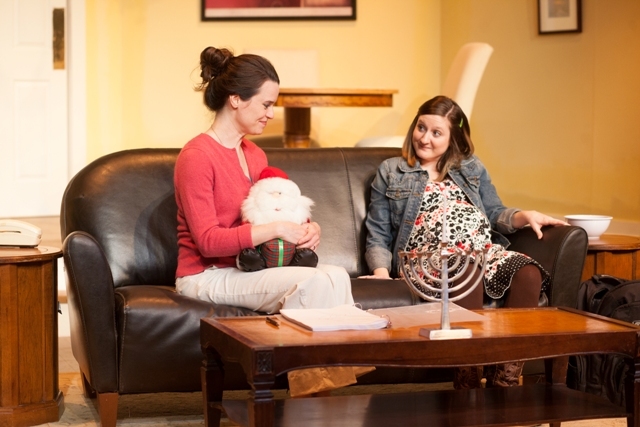 “Kosher Lutherans” is buoyed by a wonderful cast and offers a surprising twist that tests the prejudices we all harbor inside and how we overcome them. Director Marty Stanberry keeps it moving at a good clip with plenty of laughs along the way. Richard Strelinger and Julie Layton play Franklyn and Hannah, a couple who have been trying to have a child with no success. Despite working with a renowned fertility doctor- recommended by their best friends- they have been frustrated for months. They are about to celebrate Purim with those friends, Ben and Martha, played with perfection by Jerry Russo and Nicole Angeli. Although convinced they’ve remained friends only because their names are “Ben” and “Franklyn,” the guys have been besties since college and the girls have also had a long relationship. But on this holy day in Van Nuys, California, secrets are revealed that threaten the friendships. Ben and Martha are openly fighting and he threatens her with divorce. In the meantime, Franklyn and Hannah’s frustration comes to a boiling point surrounded by a possible relationship he’s had with his night school professor. Leaving his job with his wife’s father’s company, Franklyn has decided to write a novel and the female instructor may- or may not- have made advances to him. The first act is filled with both angst and outright laughter as the school chums and banter like old buddies while these two events affecting their lives keep cropping up to provoke an edge to the festivities. Then, in Act II, we meet Alison, a sheepish Midwestern girl who is pursuing a degree at a local college. She has become pregnant and decides to give up her baby to Franklyn and Hannah. As they meet to sign the papers to complete the deal, they suddenly realize that she doesn’t know they’re Jewish. Could this be a deal breaker to the girl who admits the only she knows about Jews is what her father told her- “they own Hollywood and they killed Christ?” This causes a flurry of activity that involves our couple deciding- unsuccessfully- to pretend to be Lutheran to appeal to her heartland sensitivities.” Beth Wickenhauser completes this outstanding cast with a wide-eyed, innocent portrayal and, when she finally decides to agree, levels a bombshell of her own. A final scene with the two couples reunited for the First Night of Hanukah brings two final twists that complete an outrageous but satisfying journey into how people react when tested to the limits. The clever William Missouri Downs script is perfect for the season and this cast simply shines while bringing laughs and smiles to this sometimes harsh but extremely heart-warming story. The effective scene design by David Blake is versatile and realistic while Maureen Berry’s lights enhance the story as well. Felia Davenport’s costumes are just perfect and, on the night I saw the production, we were once again reminded of the magic of live theatre. A slight technical glitch with a doorbell with a mind of its own didn’t phase the cast at all and the audience was too wrapped up in the proceedings to even notice. It’s such a treat to see the outstanding work done by all of our local theaters and HotCity’s latest is no exception. Catch the fun and heart of “Kosher Lutherans” through December 21st at the Kranzberg Center. Give them a call at 314-289-4063 or visit hotcitytheatre.org for tickets or more information. This entry was posted on December 15, 2013 at 9:43 am12 and is filed under Uncategorized. You can follow any responses to this entry through the RSS 2.0 feed. You can leave a response, or trackback from your own site.